This card is made using a single layer of a paper table napkin. I very gently applied glue to the napkin and positioned it on the card. Then I went looking in my files for a patriotic House Mouse. This I printed off and glued him to a piece of cardstock to make him firmer. I added 3d risers behind it and positioned him on the card. Then I used the alphabet die I have to cut the lettering in black and position it on the front of the card. Inside I added a flag waving house mouse, patriotic balloons, and Happy July 4th in alternating red and blue colors. 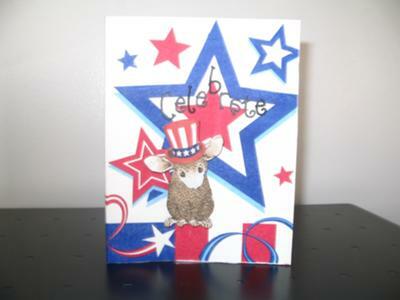 This was a custom ordered card for a neighbor who wants to send it to a friend in the USA. Very cute and the mouse is delightful. I love the red, white and blue colour scheme and it is very patriotic. I am sure that your neighbour was delighted with the card and also the friend in the USA when she gets it. We have some big celebrations coming up this year in the UK ... the Queens Diamond Anniversary and of course the Olympics so this is a colour scheme that is going to be used a lot in the next few weeks. Great card and what a cute little mouse. I love your card!! I have used napkins before and they are tricky to work with, but make a great card!! Mine were done with breast cancer napkins for a relay auction.